View my full Product Line On ETSY! I offer a full range of Civil War era garments and accessories and specialize in corsets. Historical accuracy is important to me. I try to use 100% natural fabrics including cotton, wool and linen. I try to avoid modern convinces like Velcro, zippers and elastic. There is a big difference between “costumes” and “reproduction clothing”, there is a place for both – I wish to offer reproductions. I try to keep a variety of items in stock but it seems to be a loosing battle. I am usually so busy creating custom pieces that I have very little time to invest in stock items. I am always glad to take on custom work. I’ll listen to your ideas, share my own insights, and ask a lot of questions to create the perfect piece for you. There is always a waiting list though. The length varies but it’s usually between a few weeks to a few months depending on what is going on. I am usually open to new ideas but it takes a LOT of time to develop a new product. If you are looking for something that I don’t offer I may or may not we willing to try to develop it. With that said though, most of my most popular items were created through the requests of clients so I’m more than happy to consider it. However, Jim, I will not be making kepis!!! 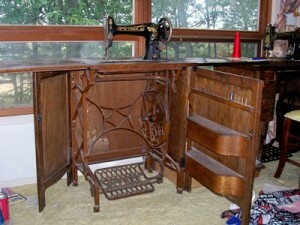 I have a passion for antique sewing machines. At them moment I have a dozen treadles as well as hand crank and toy machines. (Things got out of hand.) They range in age from the 1840′s through the mid 1900′s. They are works of art and craftsmanship! I love to sew on them and most of my work is done on either a 1914 White Rotary or 1889 Singer. 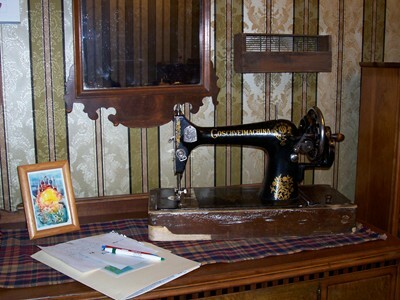 My “Treadle Treasures” name was not chosen because it sounded cute. Each piece I create is special, a treasure, and they are created on a treadle machine. I offer historic reproduction clothing, made from historic patterns and research, sewn on antique sewing machines … then sold over the very modern internet. Re-establishing the Pony Express proved too challenging! 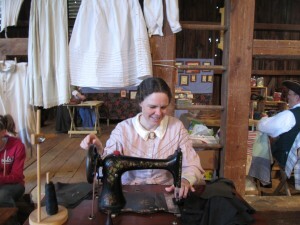 I am demonstrating treadle sewing on the 1889 Singer at Warrior Run PA. This Free brand machine was promoted as “The sanitary sewing machine” because the treadle lifts up when the machine is lowered making it easier to clean underneath it. This hand crank machine looks like it was originally made by Singer. It has decals on it from the USSR though. I purchased it from someone in Canada. Don’t you wish it could talk and tell it’s story?! ?